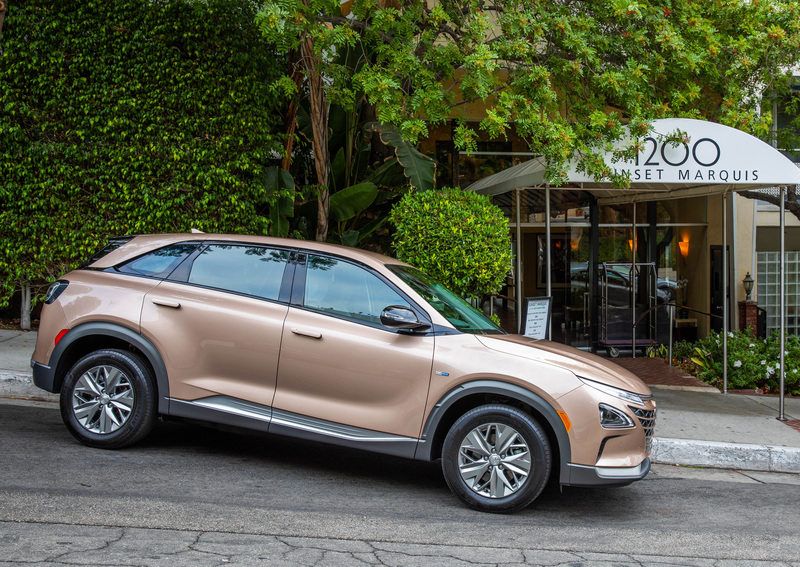 The 2019 Hyundai Nexo Fuel Cell Electric Vehicle, a replacement for the aging Tucson FCEV, will go one sale in California before the end of the year. The crossover fuel cell vehicle made its U.S. debut in January at the Consumer Electronics Show in Las Vegas, but without much by way of detail. Hyundai corrected that this month with the release of a list of equipment, powertrain and other information – including range of up to 380 miles and word that the 2019 Hyundai Nexo Fuel Cell Electric Vehicle still will be available only at a tiny handful of authorized California dealerships. That’s two in Southern California and one in Northern California. Period. Availability is limited because California still has almost all of the publicly available hydrogen fueling stations in the nation. Like the Tucson and other FCEVs, the Nexo’s fuel cell system requires compressed hydrogen to make electricity. On the plus side, Hyundai will sell as well as lease the Nexo. The Tuscon FCEV was only available via lease. Pricing and leasing terms haven’t been released. Rollout will begin “before the end of 2018,” according to Hyundai. The 2019 Nexo will come in two trim levels: Blue maximizes efficiency and delivers up to 380 miles of range per fill-up; Limited is biased toward sportier appearance and customer convenience with larger wheels, a sunroof, and Hyundai’s new remote parking assist system that can let a driver park the car without being in it. That last is great for tight parking spaces, although sill no guarantee the guy next to you won’t ding your doors when he opens his to squeeze in. The Limited’s larger wheels and tires (more rolling resistance) and the weight of goodies such as the sunroof detract from fuel economy, though. The 4,116-pound Limited’s fuel efficiency is rated at an estimated 57 mpg-equivalent, versus the 3,990-pound Blue trim’s 61 mpg-e. That gives the Limited up to 354 miles of range per fill. Thanks to improvements and refinements in vehicle design and fuel-cell system function, both Nexo trims beat the heck out of the Tucson FCEV they are replacing. 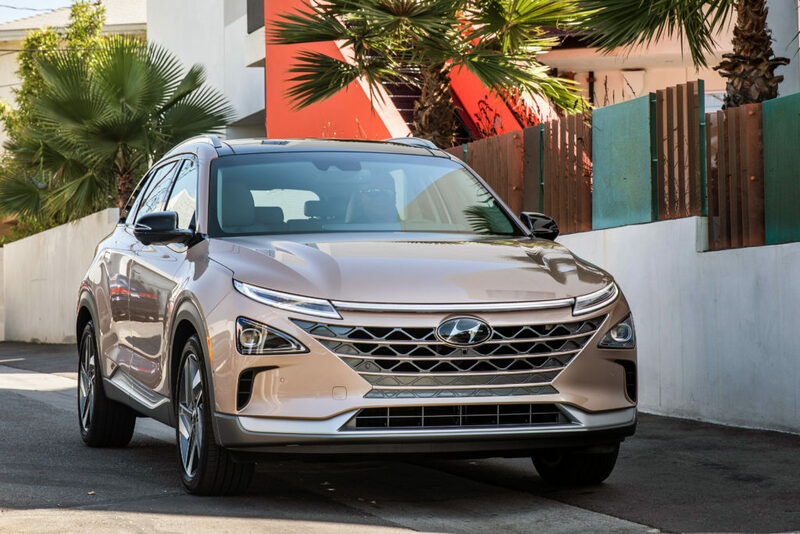 The Tucson was rated at just 265 miles per fill-up and 50 mpg-e.
Hyundai increased range by improving aerodynamics, developing a lighter powertrain, improving fuel cell system design and efficiency and adding almost 17 percent more hydrogen storage capacity. 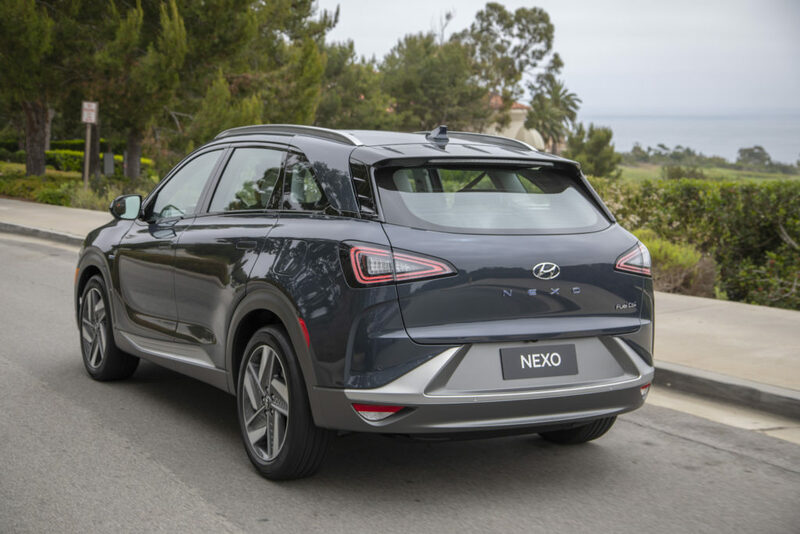 The 2019 Hyundai Nexo uses three pressurized tanks that hold a total of 6.2 kilograms of highly compressed hydrogen, versus two tanks and 5.3 kg in the Tucson. A kilogram of hydrogen compressed at 10,000 psi, or 700 bar, contains the energy equivalent of a gallon of gasoline. Fuel cells produce electricity by stripping electrons from hydrogen atoms in the presence of a catalyst. The hydrogen is then combined with oxygen and the resulting water vapor is used to help cool the system. Production of compressed hydrogen creates carbon dioxide emissions, but the gas is emission-free once on-board the vehicle. Steam and water are a fuel cell system’s only emissions, giving FCEVs their zero-emission vehicle status. The Nexo’s 95 kw fuel cell stack feeds electricity directly to the motor and to the 1.56 kWh lithium-ion battery that stores juice for release when an extra jolt of power is needed. Hyundai rates the Nexo power output at 161 peak horsepower (120 kilowatts) and 291 pound-feet of torque. That’s 20 percent more horsepower and 31 percent more torque than the Tucson FCEV’s 134 ponies and 221 lb.-ft. Acceleration, while still pokey, is almost 25 percent better than the Tucson FCEV. The 2019 Hyundai Nexo shaves a full 3 seconds off the smaller and lighter Tucson fuel cell’s positively lethargic 12.5-second 0-60 mph acceleration time. 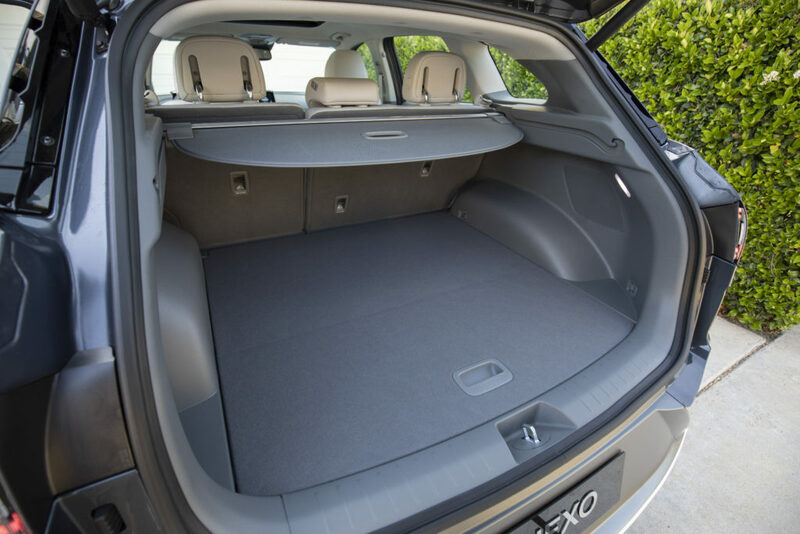 The Nexo’s larger dimensions – it is 10.3 inches longer and 1.5 inches inches wider than the Tucson – give it a bigger passenger cabin and more cargo space. Its longer wheelbase should provide improved ride quality as well. The base Nexo Blue comes with 17-inch alloys; LED lighting all around, automatic headlamps; heated side mirrors with integrated turn signal indicators; a hands-free rear liftgate; heated, power adjustable front seats; 60/40 split rear seats; faux lather seating (Hyundai calls it vegan leatherette); a leather-wrapped steering wheel (apparently non-vegan); an infotainment system with navigation, a 12.3-inch touchscreen, satellite radio and Apple CarPlay and Android Auto compatibility; Qi wireless device charging; automatic climate control with rear vents; power windows and locks, and remote keyless entry. The Limited trim adds 19″ alloys and tires, ventilated front seats, a heater steering wheel (still wrapped in leather) a power sunroof, roof rails, a rear cargo cover, an upgraded 8-speaker audio system and Hyundai automated parking assist with parallel and vertical parking. In addition to a plethora of airbags and air curtains and now-standard equipment such as traction and stability control, the 2019 Hyundai Nexo comes with forward collision avoidance system, rear cross-traffic warning, blind spot warning, lane follow and lane keeping assist with lane departure warning, and smart cruise control with full stop-and-go capability. The Limited trim adds a blind spot view monitor that shows images of traffic lanes on the appropriate side of the car when the trn signal is activated. The Limited also comes with and front and rear parking distance warnings. Blue: 65 mpg-e city, 58 mpg-e highway, 61 mpg-e combined. Keyes Hyundai (Van Nuys) and Tustin Hyundai in Southern California; Capitol Hyundai (San Jose) in Northern California.